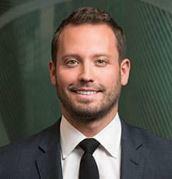 Alec obtained a Bachelor of Arts from San Diego State University in 2013 with a major in Philosophy and then went on to receive his juris doctorate from Saint Louis University School of Law in 2016, where he competed on the Trial Advocacy Team. Alec first worked for the firm as an intern in 2013. During law school, Alec also interned with the United States Attorney’s Office for the Eastern District of Missouri in the civil litigation division as well as in the legal department for the Minnesota Vikings. After completing law school, he spent a year with Creative Artists Agency in Nashville, Tennessee prior to returning to Rosenblum Schwartz & Fry as an associate in 2017. He was admitted to practice in Missouri and the United States District Court for the Eastern District of Missouri in 2017. He was admitted to practice in Illinois in 2018. Alec's primary area of practice is personal injury and criminal defense.